This album will also be available in CD format with a 4-page booklet. Ask for it through the contact form. Today my latest musical work Rounded Songs – Canciones redondas has been published on digital platforms, Spotify and similar. Thus culminate two long years of intense work: the composition of the themes, the assembly with Cántica Cuarteto, the recording, the mastering, the management of the release. The effort behind a record is endless, as many musicians are well aware. Finally, you put it on the market and expect the public to welcome it with benevolence. 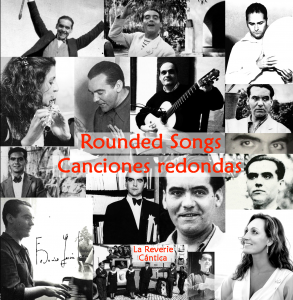 Rounded Songs – Canciones redondas is dedicated to Federico García Lorca. Ten of his poems set to music with a style different from the usual ‘flamenco touch’ that pursues him. The sounds in this work dance between folk, classical music, contemporary, ethnic, singer-songwriter style … It has always been difficult to label my music, my music is simply me and in this case, also Federico García Lorca. I feel quite suited to musicalize Lorca’s poems. On the one hand because his verses have always accompanied me, because I am from Granada and have breathed the same air as the poet. On the other hand, as a child, I played in a friend’s country house, which we called La Huerta. It was located a few hundred meters from La Huerta de San Vicente, in the fertile plain of Granada. Federico was an important part of that environment, a familiar and mythological presence. I am very grateful to my colleagues from La Reverie – Cántica Cuarteto, for having helped me so much to dress these songs. Yolanda Campos has done a fantastic job with her voice and with the adaptation of the texts. Inma Gómez, in addition to her great skill with the flute, has been a constant stimulus, and without her encouragement we would never have finished the album. Ángel Martín, with his percussions, has put color and life into the music. And last, but not least, my thanks to Marie Wohlfeil, my wife, for her support and for taking care of a lot of the hidden work: designs, management, and much more. smelling of horse and shadow. Soledad, whom are you calling for? alone and at these hours? tell me: what do you care? my happiness and my own self. to be swallowed by the waves. under the rustle of its leaves. Soledad, how much pain you feel! your mouth soured by waiting. from the kitchen to the bedroom. jet black, and so do my clothes. in the streets of Seville. with gallants of past days. the same as the fir tree. the ash sky of your gaze. Be careful with my little leaves. playing the ferris wheel of love.